Kabbalah Home/Kabbalah Worldwide/The 2nd Holocaust - How can we prevent it? We are still masters of our fate; the choice is still in our hands. Let’s not miss out again. I was born a year after the end of World War II. During my formative years, we spoke of the lion share of my family members in the past tense. They were gone, perished in the Holocaust. The writing was on the wall but most Jews refused to read it. Now it is on the wall again, blasting at us from newspaper headlines and posts on social media. If we turn a blind eye once again, a second Holocaust will happen, and more expansive than the first. We can prevent it, but we must not wait. The 50 odd members suspended from the UK's Labor Party are not rotten apples in an otherwise liberal and progressive entity; they are the tip of the iceberg. Jews have been, are, and will remain pariahs wherever they are, as long as they refrain from taking on their age-old task: to bring the world to peace. Wherever we look, the world is spiraling to chaos. Superpowers are playing “chicken” with fighter jets; terror groups are petrifying the world with Toyota pickup trucks, machetes, and inhuman cruelty; zero interest rates in financial markets are making the filthy rich even richer, and filthier; and every other person consumes antidepressants like they were vitamins. Is it any wonder that drugs, which former President, George Bush, described less than thirty years ago as “the gravest domestic threat facing our nation,” have become our new best friend? No one is singing now. The world is in survival mode. Our world has become dense, cramped, interconnected and interdependent. At the same time, we have grown estranged, alienated from each other. The tension between our anti-social tendencies and our compulsory tightening connections has become so high that it can snap at any moment. Yet, we cannot grow apart. Like all other parts of reality, we have become an inseparable mesh whose parts depend on one another for survival. But unlike the rest of reality, we detest being dependent on others. We want to rule, dominate, command, or at least be left in peace. None of these are possible. Connection is the law of life. Without it there is no creation or evolution. Nothing persists without positive and reciprocal connections to its surroundings. Therefore, humans must learn to connect that way, as well. And when the going gets tough, the Jews take the heat. It does not happen because some crafty ruler blames us in order to avoid being blamed for his or her own failings. 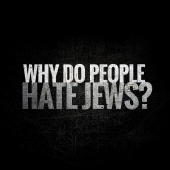 The masses’ anger at the Jews is genuine. They feel that (somehow) the Jews have caused their troubles. They may not be able to logically explain their anger, but their feelings come from deep within. So it was in 15th-century Spain, in 19th-century Russia, in 20th-century Germany, and so it is today. But we the Jews should know the answer, because we were once much more aware of our role. Our forefathers knew that all our troubles come from bad connections among people. This is why they became a nation only after they pledged to love their neighbor as themselves. They knew that bad connections drive people to war instead of peace, to denigrate instead of compliment, to take instead of give, and to kill instead of heal. And only they, our ancestors, managed to connect in a non-self-centered fashion. These ancient Hebrews became the nation of Israel when they pledged to be “as one man with one heart.” Putting aside differences of ethnicity and background, they adopted the maxim, “Love your neighbor as yourself,” and found in it a treasure-trove of power and vitality. As Abraham had taught them, they realized that this is how life should be, that the world was far from it, and that they must take upon themselves the task to be “a light unto nations,” to bring about Tikkun Olam, the correction of the world, through the special connection they had discovered. And yet, instead of spreading our special method of connection, 2,000 years ago we readily descended into hedonism. And though we were banned and ousted from most places, confined to our shtetls, our Jewish towns, we did not lose our faith that some day we would be emancipated and allowed to be like all the others. Luminaries such as Leo Tolstoy asked, “What is the Jew?...What kind of unique creature is this whom all the rulers of all the nations of the world have disgraced and crushed and expelled and destroyed; persecuted, burned and drowned, and who, despite their anger and their fury, continues to live?” Other people of acclaim, such as Mark Twain, reflected on the Jews and finally concluded that “All things are mortal but the Jew; all other forces pass, but he remains. What is the secret of his immortality?” And yet, it never occurred to us that there is a reason for our survival. After the Holocaust we have been given a recess, a chance to reconnect to our task and to each other. We chose to take this unprecedented freedom and do exactly what we had set out to do 2,000 years ago when we were exiled—to mingle with the nations to the point of oblivion. But if we disappear, the world will lose its one hope of finding the right way to connect, through love of others and mutual responsibility. And so the world must drive us back together, and the window of opportunity to foster our connections pleasantly is closing. We can change the tide. All we have to do is learn how to connect just as before. The seed of love of others is within us. We only need to “water” it a little with some good will to transcend our righteous indignation at each other and see that we are all one nation, bonded by a common goal—to benefit humanity by sharing the right way to connect. Being “a light unto nations” is not some lofty, archaic notion. It is a very earthly task: Bond with one another until your hearts connect, then teach others how to do the same through your example. The world is aching for it, and accuses us of causing all the wars because it does not feel that we are spreading love. If we learn how to love each other, and share this knowledge with the world, then people will not feel that we are causing wars. They will know that we are the bearers of peace, of Tikkun Olam. We can prevent the second Holocaust. All we must do is little-by-little, unite “as one man with one heart.” We are still masters of our fate; the choice is still in our hands. Let’s not miss out again.